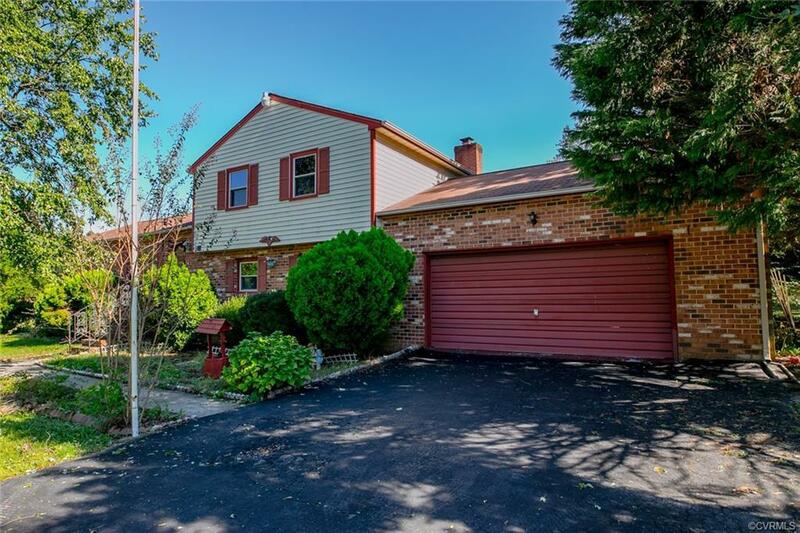 Not your typical tri-level home with over 2600 sq ft of livable space on a huge corner lot that includes a separate lot. Features include, 3 bdrms, 1.5 bthrms, dining rm, eat-in kitchen, family rm, den, laundry rm, 2 car attached garage, screened in porch, covered patio, fenced in yard and 2 large storage sheds. Kitchen has access to backyard but more importantly offers lots of countertop space with plenty of wood cabinets for storage and a nice eat off bar overlooking into the dining room. 3 bdrms are located upstairs that share a large bathrm. Enormous family rm boasts a big bay window, arched openings and double ceiling fans! The den has a gas brick fireplace with mantle and heath, beamed ceilings, half bath, laundry rm and access to the 2 car garage. Home has been landscaped with established perennials and decorative trees, paved drvwy and fenced yard. Highlights:Central Air, Vinyl Windows, Sheetrock behind Paneling, great location! Directions: Courthouse Road In Prince George, Take Right Onto Redwood Lane, Take Left Onto Cottonwood Lane. Home Is On A Double Lot On Your Right.